Want to cut the price of your grocery shopping in half? 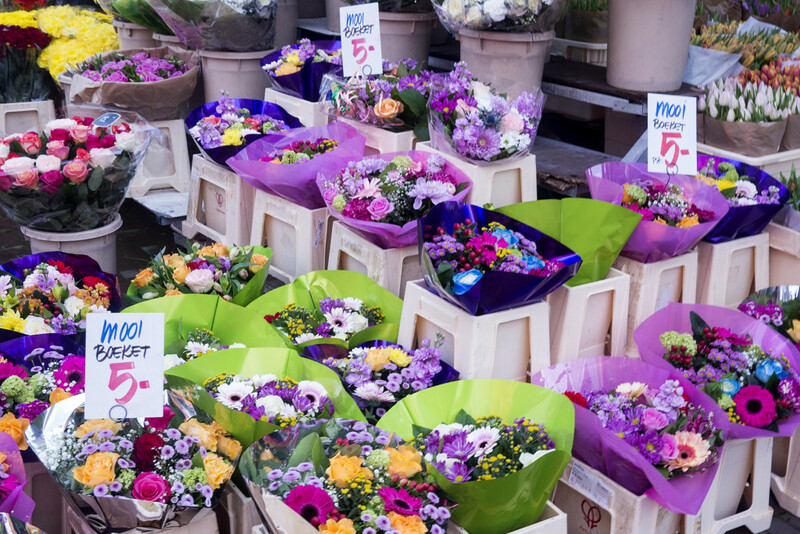 Then get yourself down to the Haagse Markt – the biggest open air market in the Netherlands. 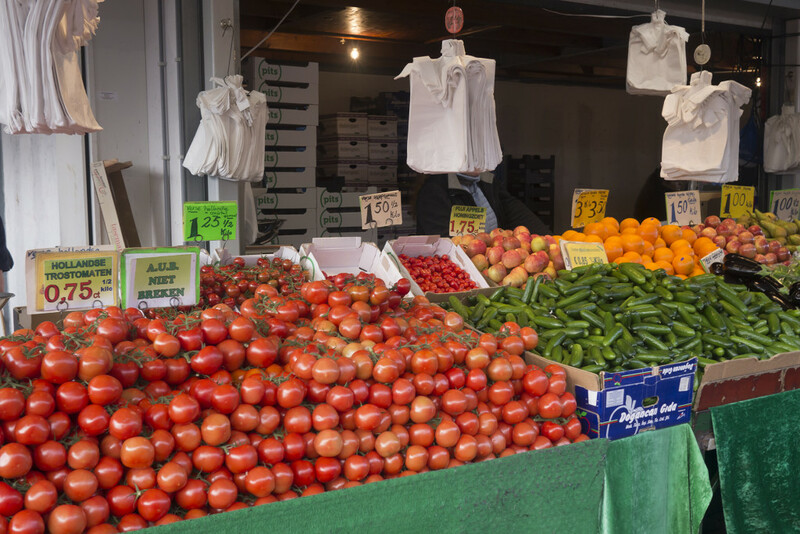 Let’s start with tomatoes and cucumbers, which we always get at the stall in the photo below. Snacking tomatoes (snoep tomaten) are €1.50 for 500g, versus €3 at Albert Heijn and Jumbo. Vine tomatoes (tros tomaten) are just €1.50 per kilo compared to a whopping €4.20 at Albert Heijn. Even the very cheapest supermarket tomatoes (ordinary, not vine tomatoes) we found online were double the price of the vine tomatoes at the market. How about fruit? 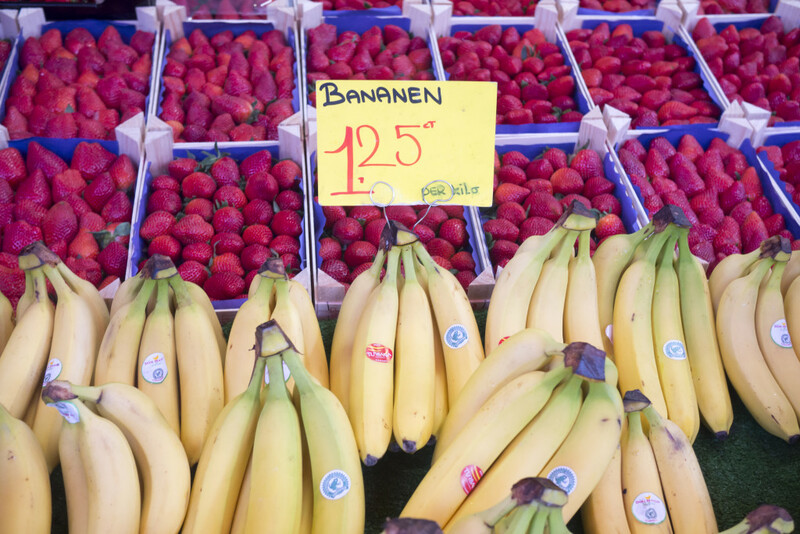 Last week we picked up bananas for €1.25 per kilo. Albert Hein sells only Chiquita bananas online at €1.89 per kilo (here we have to admit that Jumbo does have a good deal on bananas at €0.99 cents per kilo year round, but then you have to pay the rest of the Jumbo prices). Those gorgeous trays of strawberries in the background? Just €2.50 each. 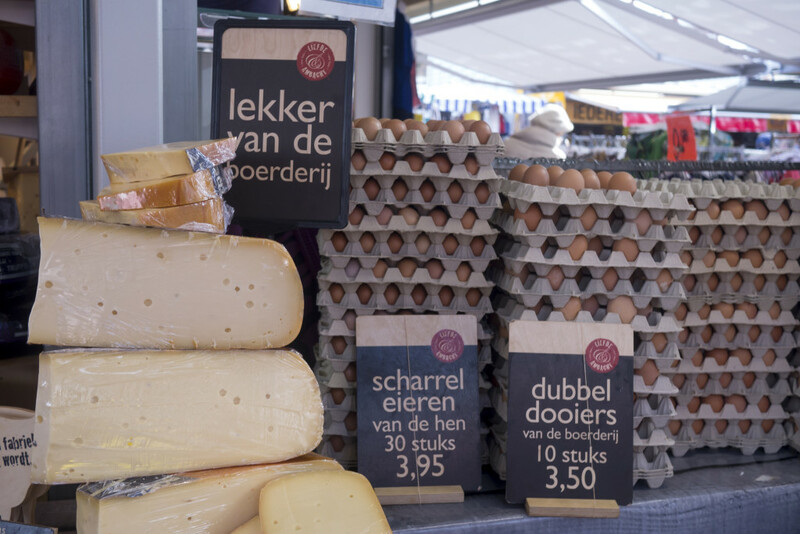 Eggs come from our favourite cheese stall (kaas boer) at the market: Liefde & Ambacht. Tip: try the “Jumbo” cheese — so called because the wheels of Jumbo cheese are huge! That’s the Jumbo cheese in the left bottom corner of the photo. Cheese and eggs from Ambacht & Liefde. Yes, they really are this cheerful every time they serve us! Our favourite, ridiculously happy cheese seller at the Haagse Markt. Photo by Liefde & Ambacht. We could go on, and on, and on… Limes? Fifty cents each at Albert Heijn, versus 10 for a euro at the market. Mangos? Two euros each at the supermarkets. For the same price, you get three mangos at the market. Carrots (waspeen)? €0.80/kg versus double that at Jumbo. Luxury mixed nuts (luxe noten mix)? Twelve euros per kilo at the market, or €17-20/kg at the supermarkets. It’s your choice! And in this post we haven’t even touched on the bargains at the market. Whenever you see produce piled up in little baskets, it’s a euro. Most things in the baskets are close to going off, but if you know you’ll go home and use it within 1-2 days, you can cut your food costs in half again. For the last two weeks, we’ve picked up pointed sweet peppers (puntpaprika) 4 to a basket (making them €0.25 each) versus a minimum of €0.85 each at the supermarkets. Don’t forget some flowers on your way out! As one lady said to us on the tram on the way home (both of us with shopping bags stuffed full), “You’re stealing from yourself if you go to the supermarket”. We couldn’t agree more. The only downside of the market is that (like all markets) its hours are limited: Mondays, Wednesdays, Fridays and Saturdays. Official opening times are from 9am, but in our experience there are always more than enough stalls open by 8am, and it’s worth going early on the weekend. After 10am on a Saturday the market starts to get seriously crowded. The crowds are not such an issue during the week or when it’s raining. Where to find it: The market is close to the Hobbemaplein tram stop (tram 6, 11, 12 and bus 25) as well as Hoefkade stop (tram 11, 12 and bus 130). There are free, guarded bike parking areas on both ends of the market.